Start checking your old wallets. A new law that goes into effect Sept. 1 will allow Texans to receive a cash refund on gift cards or certificates that have a balance of less than $2.50. The transaction must take place in person and there are exceptions. The law will not apply to prepaid calling cards, cards issued as part of a loyalty or rewards program, cards issued as a refund for returned merchandise, cards issued by a bank or airline, or cards initially worth $5 that cannot have value added to them. The law's author is state Rep. Dwayne Bohac, R-Houston, a former business owner who says he penned the bill to strike a balance between the rights of consumers and retailers. "I believe all of us are carrying around gift cards where we've used up virtually all the money," said Bohac, who owned gift shops. "I wanted it to be $5, but $2.50, it seemed like people could live with that." Though he acknowledged that retailers could see it as an infringement on a private contract, Bohac called it a "lay-up bill" because it faced little opposition in the Legislature. It passed in the House by 110-20 and in the Senate 26-5. The Texas Retailers Association, which represents thousands of stores in the state, keeps close tabs on legislation affecting businesses. President Ronnie Volkening said the association reviewed the legislation with its member stores around the time the bill was introduced and heard few complaints. "We don't think that's going to be a heavy burden," he said of providing cash refunds. "It's consistent with good customer service to volunteer to do that." 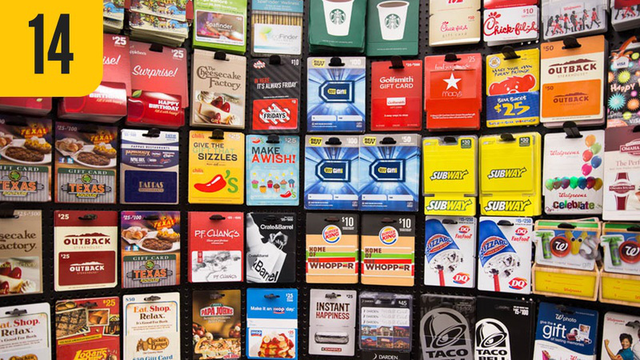 This is not the first law to address gift cards in the state. In 2005, lawmakers passed a bill that required expiration dates on gift cards to be clearly disclosed. State law requires that retailers send money from unused or expired gift cards to the state comptroller's office after a certain period of time. That office announced in December that it was holding nearly $12 million worth of unclaimed gift cards. The new law is not likely to significantly change that. A small fraction of that amount, about $63,000, comes from gift cards that have a balance of less than $2.50, according to the comptroller's office. A number of states have laws requiring cash refunds for gift cards with low balances. California offers the highest amount: refunds on gift cards with a balance of up to $10,according to 2013 data from the advocacy group Consumers Union. Rhode Island and Vermont offered the lowest, a refund on gift cards with a balance of up to $1.